Eastern white cedar trees are popular ornamental and landscaping trees throughout North America. These trees make effective hedges or solitary accents to your landscaping. They are relatively hardy, can be moved easily, and live a fairly long time with basic care and maintenance. 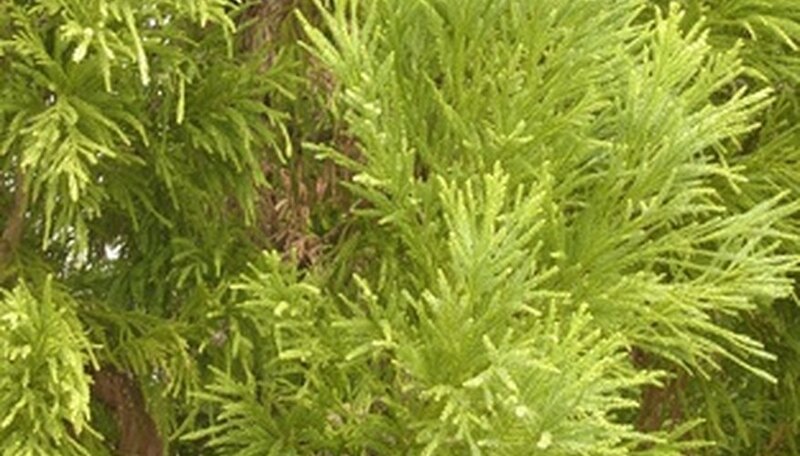 However, there are some infections and diseases that can wipe out your eastern cedar if you do not recognize and address the problem early. Keeping an eye out for signs of trouble will help you spot eastern white cedar diseases in time to save your tree. Shoot blight is caused by the fungus Pestalotiopsis funerea. Generally shoot blight affects new growth, and damages the tips of cedar foliage first. If left unchecked it creeps back toward older growth, and can kill foliage, twigs and even branches. Treat this problem with a fungicide, and remove affected growth using sterile pruning techniques, and throwing the pruned branches away in a garbage bag rather than dropping them on the ground. Generally shoot blight is a secondary invader, which means that if you notice shoot blight, you need to check carefully to see if some other condition is compromising the health of your tree, such as malnutrition, crowding or over-watering. Root rot is caused by Pythium and Phytopthora fungi, which grow on cedar roots that are too moist or wet. If you dig into the soil at the base of your eastern white cedar, you may find white mycelium (fungal threads) or black strings of fungi. Root rot tends to result in defoliation, because the tree cannot draw water anymore, and blackening of leaves and branches. Generally root rot cannot be cured, but you will need to remove the tree to prevent its spread. You can help prevent root rot by treating the trees with a preventative fungicide, by watering in the mornings--only when the tree actually needs the water--and by making sure that the soil is well-drained and sufficiently full of nutrients, since healthy trees can often ward off diseases on their own. Unlike many blights that turn shoots and leaves brown, Kethia blight creates black holes on the leaves which eventually rot away ,while the remainder of the leaf turns white. White cedars respond to Kethia blight by dropping leaves and even branches. Kethia tends to affect lower branches first, and can kill a young eastern white cedar. You can treat this blight with fungicide and by using sterile pruning and disposal methods on infected branches. British Columbia Ministry of Agriculture and Lands: Dying Cedar Hedges--What is the Cause?